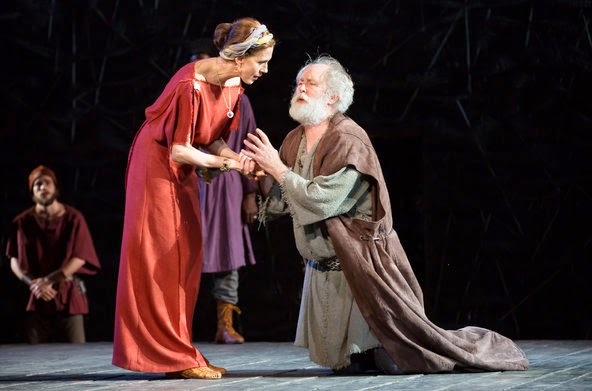 So far in 2014 I have seen three live productions of King Lear: one in Brooklyn, one in Manhattan, and one broadcast live from London to Queens. My friend Horvendile has seen those plus one more. The latest is the undercooked production that had its first performance on a hot summer night at the Delacorte. The weather was well programmed, with hard, hot winds whipping through the tree tops around the theatre in time with the light- and sound-designed storm at the end of the first half and beginning of the second. This King Lear is the production of the New York Shakespeare Festival directed by Daniel Sullivan. However, the first night’s performance showed little evidence of direction after the opening scene. John Lee Beatty’s scenic design (an elevated square with raw wooden steps, a textured back wall, all in tan) in combination with the magical lighting design by Jeff Croiter and video design by Tal Yarden, was absolutely splendid, imaginative, vital, and exciting. Costumes designed by Susan Hilferty were lived in, earth toned, suited to characters and their times. Unfortunately the play did not play as well together as did its design elements. Did I mention that the play was over three hours long? And that every minute was felt? The production needs at least another week of rehearsal — and some cutting. I am not tired of King Lear. As I wrote earlier this year about a bunch of Lears (http://www.mollyismusing.blogspot.com/2014_05_01_archive.html), each combination of actors and director and space brings a different dynamic to the familiar scenes. For all those chemical reactions to work together to create theatrical magic requires tight oversight by a director with a vision. It would have seemed that, if Mr. Sullivan had a vision, he did not share it with his actors, but John Lithgow’s ill-advised blog about the production belies that notion. Nevertheless, performances were uneven and timing was awry. The interesting choices made by Jessica Hecht as Regan worked solo but not in conjunction with her fellows. The rich voice of Clarke Peters as Gloucester did not vary in tempo or texture; perhaps he did not know his lines well enough to live, rather than recite, them. And Annette Bening, whose early professional experience was stage work, forgot how to live in her body onstage — she backed up, she shilly shallied, she never stopped moving and tossing her arms about as if she were drowning. Seemingly uncertain of her lines, she came off as insecure and leaning toward panic. She had not found Goneril. The most certain, solid, real performance came from Jay O. Sanders as Kent. He and John Lithgow at least appeared to be in the same play, although Mr. Lithgow’s Lear has not dropped from his head to his gut — that is, he’s still thinking instead of being. Edmund is well played by Eric Sheffer Stevens, recently seen as Borachio in last month’s Much Ado About Nothing at the same theatre [http://www.mollyismusing.blogspot.com/2014/06/much-ado-about-summer-shakespeare.html]. Mr. Stevens may need a little aging, like cheese and wine, but he has great potential. He has facility with language, he has timing and presence. Notably, his attention to the world around him is vital in live theatre, especially when a particular movie star kept getting too close to Rick Sordelet’s well-staged final duel between Edmund and Edgar. Speaking of Edgar, apparently he’s the star of this production. Chukwudi Iwuji takes his own sweet time playing Poor Tom as totally sane, stopping the story cold as the characters on stage with him must hold until he stops talking, which he does clearly, succinctly, and slowly. Someone should tell Mr. Iwuji that the play is called King Lear, not Poor Tom. As for the Dukes (husbands of the two elder sisters), I was spoiled by the TFANA production which provided the most marvelous, wicked, and creepy Cornwall and Regan I have ever seen. Both Goneril’s husband Albany (Christopher Innvar) and Regan’s husband Cornwall (Glenn Fleshler) were solid if unimaginative. What about Cordelia, you ask. Jessica Collins’ speech and voice are clear. She cries; we do not. 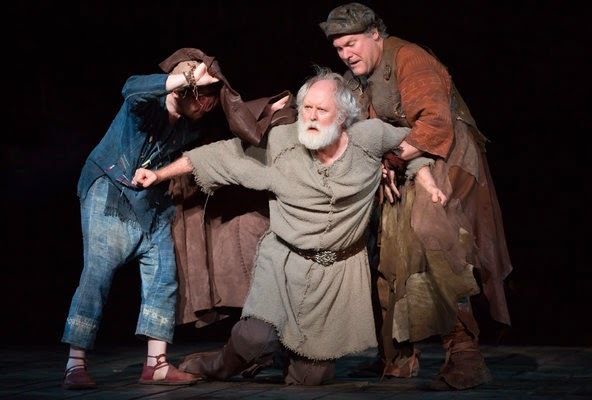 Steven Boyer as Lear’s Fool was too young and did not overcome this obstacle by creating a believable relationship with his King no matter how hard John Lithgow tried. Mr. Boyer enunciates well. The Fool’s death was done onstage so no one would wonder what happened to him. This is called dotting I’s and crossing T’s without writing whole words to contain them. Mr. Sullivan’s vision has disconcerting gaps. All in all, a disappointing (and long) evening. It may well be that all this production’s disparate characters and actors will gel in a few weeks. Some judicious cutting of the script (which should have been done a month ago) could help it all come together. For those of you who may think I’m being harsh, I have seen the first performance of a play at the Delacorte in the past. One lovely summer evening, a cast and crew came together and, for the first time, put together all the technical and creative elements, right there in front of the first night’s audience. It went extremely well. The first performance before an audience should be ready for an audience, even if that audience paid with its time not its money. Daniel Sullivan’s production of King Lear should have been much better prepared for its first night than it was. ~ Molly Matera, signing off to dream of perfect combinations of Lears and Gonerils and Regans and even Cordelias, coming in at under three hours.